Marilyn Little & RF Demeter sit in second place in the CCI3* behind her other mount, RF Scandalous. 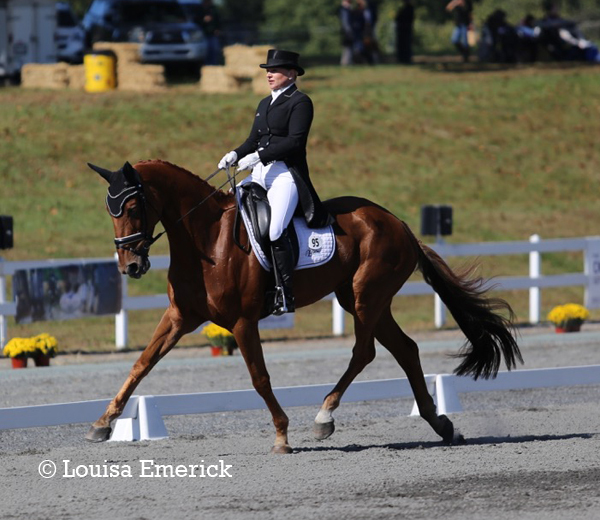 At the conclusion of the dressage phase, Marilyn Little of Frederick holds the top two spots in the CCI3* at the 2016 Dutta Corp. Fair Hill International. She remains in the lead with RF Scandalous, who she rode yesterday. Today she scored a 44.6% with RF Demeter, her longtime four-star partner to move into second place. Ryan Wood of Australia is in third place with Powell. Also riding from Maryland in the CCI3* is Lillian Heard of Poolesville who is in 23rd place with Arundel. Colleen Rutledge (Frederick) is in 38th place with Roulette and 44th place with Escot 6. Savannah Fulton (Finksburg) and Captain Jack are in 43rd place. 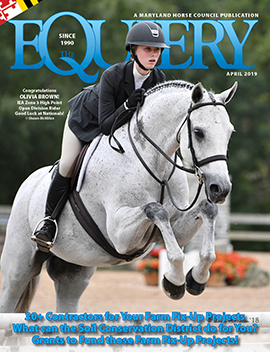 In the CCI2*, overnight leader Emily Beshear (VA) remains in first place with a 43%. Jennie Brannigan (PA) is in second with Stella Artois with Dasha Ivandaeva of Canada in third riding DB Cooper. Grace Fulton (Finksburg) made her Fair Hill debut today scoring a 61.4% with Wild Orange to sit in 36th place. Cary Chavis (DC) is in 43rd place with Game On. Cross-country starts at 9:30 am on Saturday with the CCI2* competitors first out on the course. The CCI3* is scheduled to begin at 12:25. Don’t forget to join The Equiery at our tailgate! Space B10 right in the middle of the course above the Kids’ Corner. Winning the 5-Year-Old East Coast Championships this year was the Dutch Warmblood Foreign Quality, ridden by Timothy Bourke. The reserve champion was Get Gaudi, also a Dutch Warmblood, ridden by Matt Flynn for Flynn, LLC. Matt is a Seneca Valley Pony Club graduate. Matt won the 4-Year-Old Championship with the Dutch Warmblood 2 A.M., also owned by Flynn, LLC. Jennie Brannigan rode Nina Gardner’s homebred Hopscotch was the reserve champion and also won the award for top American-bred in the championships.